According to his website Oliver & Co Spanish perfumer Oliver Valverde created his scented candle Santalum in 2010 together with four other candles, Ambrarem, Tuberosen, Terralium and Muskal. Ambrarem, Santalum and Tuberosen are still in production at this moment. The design of the container was simple and stylish to change in 2013 into a more futuristic and personalized one, inspired by space ships. I preferred the older packaging as I find it more suited to the fragrances. Oliver Valverde made the futuristic packaging to contrast the fragrances. 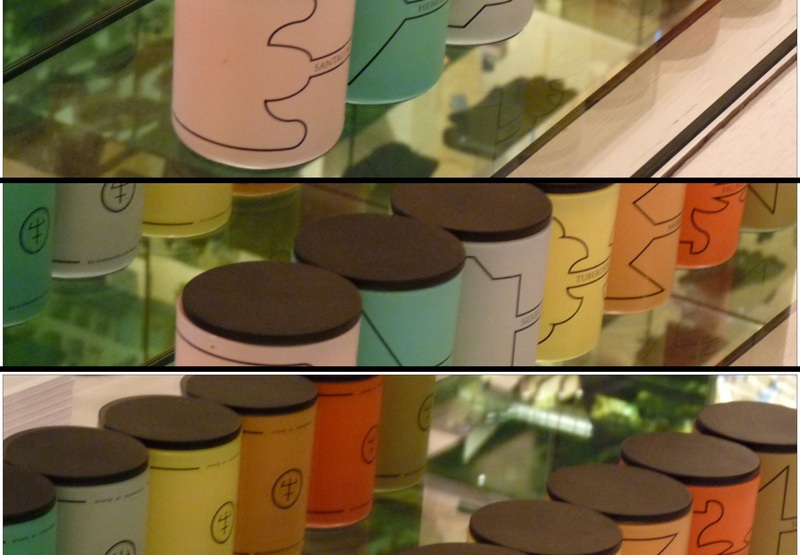 Like Oliver Valverde himself, these candles represent their own style both in packaging and fragrance. Compared to his perfumes the scented candles are less outspoken. Their throw off is marvelous and one of the best I have encountered so far to the point that the scent can be overwhelming at times. I tend to burn some of them (Ambrarem and Tuberosen) no more than one hour for this reason. All details, from the packaging to the design and fragrance are thought through and made by the perfumer himself. One of the things to keep in mind when buying a scented candle is its size. Most of the scented candles are 190 grams (for example Diptyque) but Oliver & Co candles are 225 grams so they last longer. These scented candles include a wooden lid (where some other brands charge for them) and the containers can be re-used easily. So far I have used scented candles in the scents Tuberosen, Santalum, Silver Fir and Ambrarem. They are tempting to collect and easy to re use as their colours are beautiful with all different designs. The most important thing remains its fragrance though. I believe Santalum to be my favorite one but have to admit it depends on the weather and season. The same as the scented candle Ambrarem, I wish Oliver made a perfume from it. Tuberosen and Santalum are suited for summer as they are based on the summer/late summer flowers rose and tuberose. Silver Fir and Ambrarem are both very appropriate for cold winter weather. A beautiful feminine elegant light ethereal rose and raspberry fragrance which would make an excellent perfume and reminding me of Nicolai Rose Oud. If you like Nicolai Rose Oud Eau de Parfum you will probably like this scented candle. It brings softness, soothes and relaxes. I like the idea of scented candles but I do not light them too often – even those that I already own. These colored tubes look very attractive and I’d love to try Silver Fir. Maybe it is an occasion to start to light them more often Undina 🙂 Is it because of your cat ? THE Silver Fir is wonderful, especially for Christmas. Cat does play some role in my candle-lighting habits (he likes playing with fire 🙁 ) but partially I’m just too lazy. This Fall-Winter season I’ll do it more often. I’ll try. I can imagine, Undina That your cat plays a role especially if your cat likes to play with fire. At times I am too lazy as Well and I only burn them when I am there to watch both my cat and THE candle. I really like the Oliver & Co crews fragrances. Lately I’ve been burning candles instead of my usual incense and essential oils because we’ve been moving and nothing is ever stable enough to get all that together so a candle is perfect. Everything in the one place, light and go. I like the way the candle seems to burn the bad energy from the house leaving it freshened and calm. I’m on their mailing list and I think I’ll grab some while in Europe in 2016. Nice That you are dropping by 🙂 interesting That you burn candles to get rid of bad energy I had not thought of it as a way to clear a room by replacing it by light energiewet but it does make sense. I hope your new home is nearly finished ! Oliver and Co does world wide shipping so Maybe you do not have to wait That long. His candles are very different from his fragrances. Will you be visiting other countries Than France this time ?